Welcome to wine week! Every post this week ties to alcohol. Here’s the post explaining it. 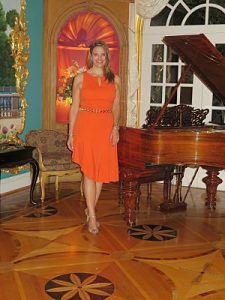 Last month I headed to Texas to work with the Amarillo Symphony Guild at Vintage Amarillo, the organization’s fundraising wine auction which supports symphony programs. 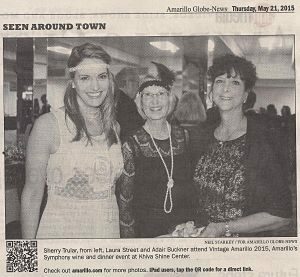 And how cool is this — I made the paper! From our outfits, you can likely gather that it was a 1920’s theme. You know why I like working as a wine auctioneer? Wine is one area I have to study in depth, and I love learning. The wine industry is enormous, so I’m learning about it bit by bit. By the time I get on that stage, I know the lots I’m selling inside and out. I know the quality of the vintages, the history of the vineyards, and likely a couple of pop culture stories about the wine. My rusty French is pulled out from the depths of my memory. It takes a lot of prep time, but I like the back stories I find. Here’s how this two-day Texas wine auction was organized. I learned to play piano on a nice Yamaha. 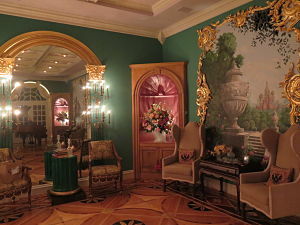 The first night was a preview event, held in a private patron’s home. This was more casual, a “garden party” style might be one description. I sold a handful of items and the co-chairs debuted the auction catalog showcasing some hard-to-find wines and exceptional experiences we would be selling the following evening. The items was nice, but — wowser! — I was blown away by the exquisite room. They call it The Russian Room, for good reason. I was told it’s an exact replica of a room in Russia. Perhaps a room in The Winter Palace? As I hate dusting, you’ll not find this Baroque style in my own home. But I can appreciate the effort and time that went into re-creating this space. Look at that photo! Hard carved floors. Elaborate mirror frames. Subtle lighting. The antique piano. Simply stunning. 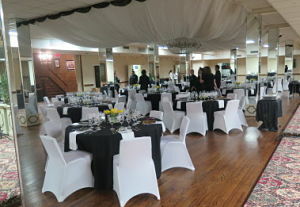 Here’s the ballroom venue for the dinner. The largest format sold was a Methusaleh of Silver Oak. The 6 bottles of Dolce made for a luminous display. No doubt the liquid gold in the bottle was just as sweet. To celebrate the 75th Masters Tournament in Augusta, GA, Armand de Brignac released a ‘Limited Green Edition’ of its popular champagne. The Ace of Spades bottle and its pewter label were fun to study up close. “Dinner at West Egg” was a nod to the 1920’s theme. A fabulous meal paired with wines that we might imagine the Great Gatsby himself serving, including Shafer Cabernet Sauvignon Napa Valley 1999 and Graham’s 40 year NV port. 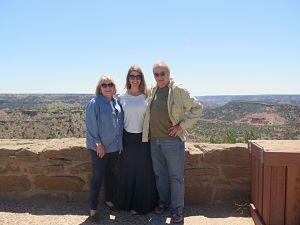 A quick sightseeing tour at Palo Duro Canyon State Park with Glenna and John. At the preview party, I met two guests who were persistent in inviting me to see the local sights. At 11 AM, Glenna and John picked me up for a drive-through tour of Palo Duro Canyon. We drove for what seemed like 20 minutes across nothing but flat terrain. Having seen a lot of this growing up in Kansas, this landscape was a real yawner. But then the earth opens up and … voila! … we see an enormous canyon. It’s the second largest in the USA, with only the Grand Canyon being larger. Knowing Texas’ desire to be bigger in everything, I bet this 2nd place finish annoys many. Beyond the beauty and seeing all the hikers and bikers out and about, our timing was pretty good in another way. We saw the Hollywood movie Kreep being filmed. One of the actors — Lymari Nadal — walked into her trailer as we drove by it. We didn’t recognize any of the actors, but using Google on our phones, we got up to speed on the show and cast. Good people. Good auction. Good trip. P.S. Friends, I placed a $450 bid on a bottle of champagne and was outbid multiple times! That bottle sold way over value. Good for the auction, but … hmph … I was trying to buy a unique gift for someone.